The service landscape is completely changing, and showing no signs of slowing down. The modern customer is more empowered, with more resources at their fingertips to do research before making a buying decision. The key differentiator? Customer service. The good news is, they're willing to give up some of their privacy in order to receive a higher level of personalized, 1:1 service. How is your company managing this balance between higher expectations and more data touchpoints? We sat down with Mike Milburn, Senior Vice President and GM of Service Cloud, to discuss his views of the changing industry and the technology that meets the challenge. Some of the topics covered include the most important metrics in the new age of service, the mobile movement, and the implications of the Internet of Things. 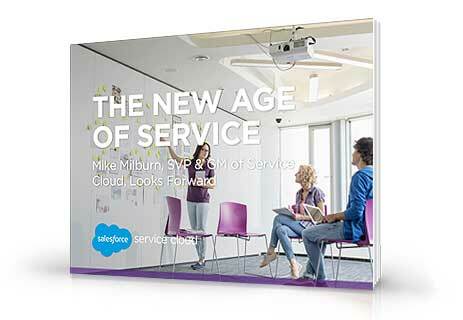 Download this free e-book to learn how Milburn views the future of the service landscape and how Service Cloud can navigate the changing tides.